Members of Joe Gandara’s family and Santa Monica officials at 26th St/Bergamot Station on Friday. Photo by Gary Leonard for Metro. 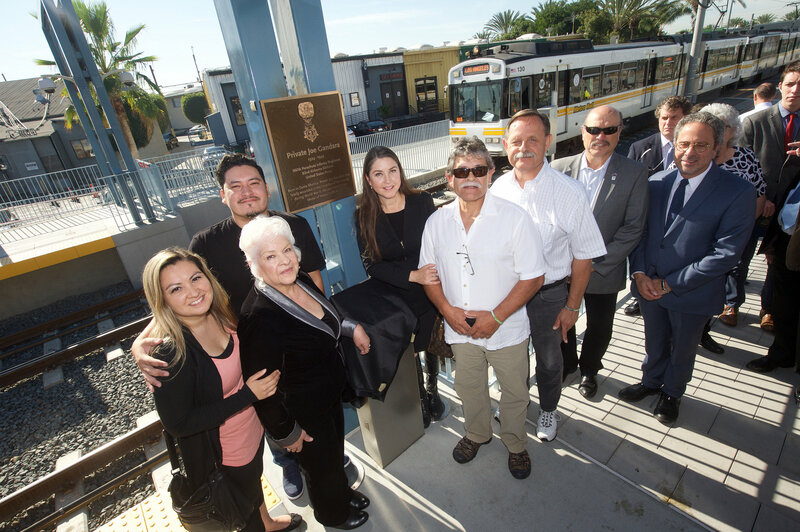 A plaque honoring U.S. Army Private and Medal of Honor recipient Joe Gandara was unveiled by The Los Angeles County Metropolitan Transportation Authority (Metro) today at the Expo Line 26th St/Bergamot Station. Private Gandara grew up in the Pico neighborhood near the rail station and was fatally wounded during the World War II Allied invasion of Normandy in 1944. Private Gandara’s heroism, valor and sacrifice in defense of freedom was recognized in 2014 when he was posthumously awarded the Medal of Honor by President Barack Obama after years of receiving little recognition. Private Gandara enlisted in the U.S. Army in 1942 and was deployed to Europe with Company D, 2nd Battalion, 507th Parachute Infantry Regiment, 82nd Airborne Division. On June 9, 1944, his detachment came under devastating enemy fire and was pinned down for four hours. Private Gandara voluntarily advanced alone toward the enemy position, destroying three machine guns before he was fatally wounded. Private Gandara also received other awards, including a Purple Heart and Bronze Star. A motion to honor Private Gandara with a plaque was approved by the Metro Board of Directors in 2015. The plaque was installed at the west entrance to the station and was unveiled at the ceremony today that included Hannah Adams, great-niece of Private Gandara. The 26th St/Bergamot Station is one of seven new stations on the Expo Line extension to Santa Monica. The Expo Line includes 19 stations and runs between downtown Los Angeles and downtown Santa Monica, with trains running every six minutes between 6 a.m. and 8 p.m. on weekdays and every 12 minutes on weekends. What a wonderfull tribute to someone who has died while serving our country. With that said, it’s time we name the other stations to honor those who served our nation in the military and gave their lives doing so. But instead the MTA has chosen to honor politicians who’s only service was getting both elected and gained personal enrichment to the tone of millions. Take down the politians names and honor instead those who truly served. Wonderful to see Metro naming stations for real heroes and not glad-handing politicians.